One of the most important decisions you can make when setting up your cover is who do you want to receive your money? When you pass away, your lump sum benefit needs to go somewhere – be it a family member, friend, charity, institution or a combination. By setting this up at the time of your application and regularly reviewing, you can be assured the benefit form your policy is going to the right person. Generally, you will not need to nominate someone to receive a trauma, TPD or income protection benefit as any benefit will generally go to the policy owner. 1. What is a beneficiary? 2. Why do I need to nominate someone? 4. How many people can I nominate? 5. What happens if my nominated beneficiary has passed away? 6. What happens if I don’t nominate someone? A beneficiary is a person nominated in your life insurance policy to receive any benefits paid out by the policy. Generally you will nominate someone at the time of your policy application; however this is reviewable and can be changed at a later stage. They can be any person or entity who you would like your benefit to go to. It may be a spouse, a child, a trust account or an organisation. You can also nominate a company if you have a Keyman insurance policy. Why do I need to nominate someone? By nominating a beneficiary, you can have peace of mind knowing that your benefit is going to the right person. A beneficiary nomination is legally binding and can generally not be contested. It may also eliminate the time and financial constraints of developing a will. In today’s society, this can take on even more important when it comes to families who have been through a divorce or when there is some tension in the family as your beneficiary can generally not be contested. You will generally nominate someone to receive your benefit at the time of your policy application; however it can also be completed or changed at a later date. 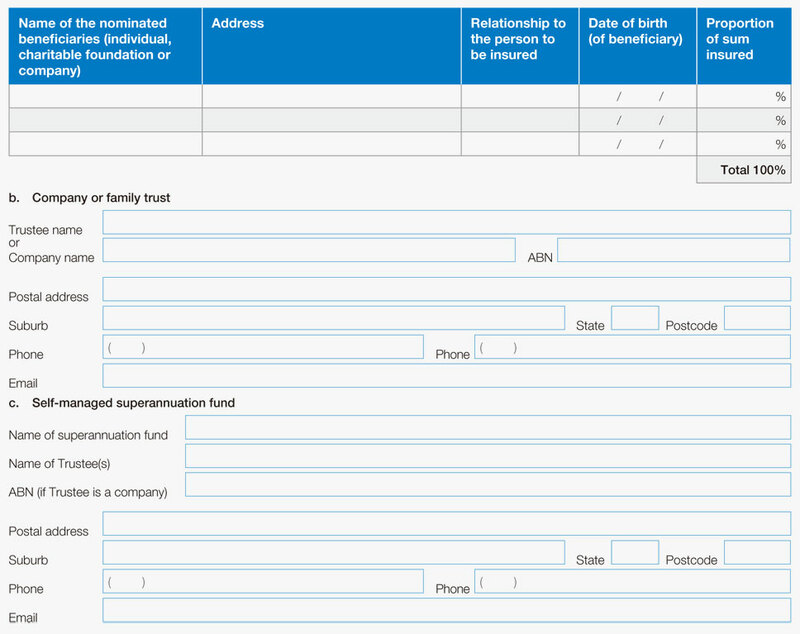 Nominations include detailing the personal details of your beneficiaries as well as what percentage of your money you want them to receive if you have nominated multiple people. Currently there is no legal limit however industry in standard is for up to 5 to be chosen. This number may differ between insurers. It is also important to note that the more beneficiaries you choose, the longer your life insurance company may take to process the claim. What happens if my nominated beneficiary has passed away? If a nominated individual has passed away at the time of your death and the policy has not been updated to reflect this, then that portion of the individuals benefit will generally return to the policy owner. What happens if I don’t nominate someone? If you do not choose to nominate someone to receive your life insurance benefit, it will generally be passed back to the policy owner. If the policy owner and the insured are the same, the lump sum benefit will go towards their estate and may be distributed according to the will. If no will is present, the lump sum benefit may go through letters of administration and be subject to relevant state legislation. You should review your beneficiaries each year, as well as all your life insurance policies. By regularly reviewing who your beneficiaries are, you can make sure your benefit goes to the right person. This becomes even more important if you have more children or go through a separation, divorce or if you re-marry. Can a person still be a life policy owner / beneficiary even after 15 years divorced? Hi Bruce, thanks for contacting us. To answer your question – Yes, a person will remain the policy owner and / or a beneficiary after a change of circumstances for example after a divorce. For example the wife may be the policy owner and the sole beneficiary when a policy is established on the husband’s life. Say a divorce occurs and she refuses to change policy ownership to her husband and as long as she continues to pay the premiums, the policy will remain in its current format with her as the sole beneficiary on her husband’s life. As you can see the Policy Owner has the control over the policy and therefore is the only person who can alter the nominated beneficiaries which some people may consider after a divorce or when there is tension in a family as generally the beneficiary cannot be contested. Can you nominate a charity as a beneficiary for your life insurance policy? Thanks for your question Jodie, the answer here is yes you can nominate a ‘Charity’ as a beneficiary on a life insurance policy. However, it is important that this is clearly defined and by this we mean that the Organization or Institution’s Name, Address, Registered Charity Number is accurately reflected on the beneficiary form. It may be worth speaking to the Charity Representative or Manager to obtain this. This is to prevent a potential conflict or dispute at claim time. Can I nominate a company as my beneficiary for my life insurance policy? Yes, you can nominate a company as your beneficiary. However, the life insurance benefit may be tax accessible to the company. You should seek the advice of a tax specialist as there may be taxation consequences on the benefit payment you may not be aware of. Remember, you can only nominate a beneficiary if you are the policy owner on the policy. Yes, you should generally be able to nominate your grandson as beneficiary even though he lives overseas. However, you’ll need to contact TAL directly to inquire about the tax implications when a payout is made. Please note: Nominating a minor as your beneficiary could result in some difficulties, as he’ll usually only be able to access the payout when he turns 18 years old and the lump sum will not typically be paid to his mother unless she is nominated as your beneficiary. Instead, you might want to arrange that your life insurance benefit gets paid into a trust that will pay out to your grandson when he is of a certain age.